I love this recipe because it transforms a traditionally individual dish into a family-friendly, shareable meal. 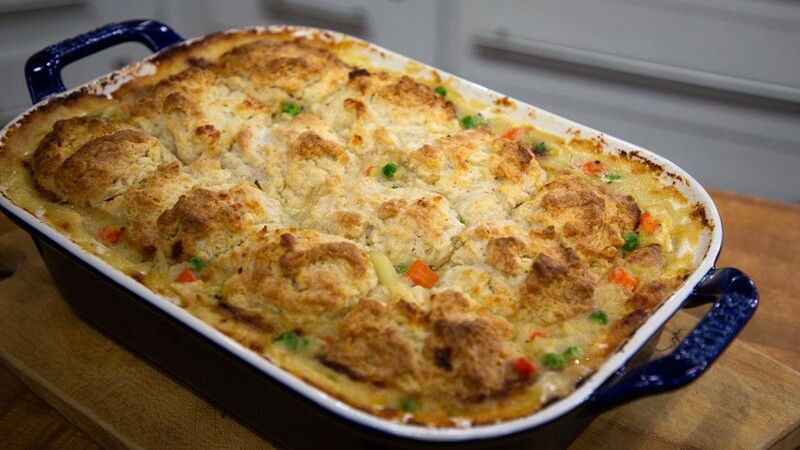 The biscuit topping is also a unique touch that makes it all the more comforting and delicious. 1. Season chicken lightly with salt and pepper. Let rest 15 minutes. In a medium pot over medium heat, combine chicken, stock, wine, garlic, bay leaf, thyme and rosemary. Bring to a simmer and cook chicken gently until no longer pink, 10-15 minutes. Transfer meat to a plate to cool completely. Strain and reserve cooking liquid (you should have about 2¾ cups). Once chicken is cool, shred into bite-sized pieces. 2. Preheat oven to 375°F. Lightly grease a 9- by 13-inch baking pan. 3. Melt 4 tablespoons butter in a large skillet over medium-high heat. Add leeks and shallot and cook until softened, about 5 minutes. Melt in 4 tablespoons butter. Stir in 1/2 cup flour and cook, stirring occasionally, 2 minutes. Slowly whisk in the strained stock and cream. Season with 1 teaspoon salt and pepper. Bring mixture to a simmer. Stir in carrot and potato; simmer over low heat, stirring frequently, 10 minutes. Stir in chicken, peas if using, and lemon zest. Scrape mixture into the prepared pan. 4. In a large bowl, whisk together 3 cups flour, baking powder and 1½ teaspoons salt. Cut the remaining 10 tablespoons butter into cubes; using a pastry cutter or two forks, mix into flour until mixture forms coarse crumbs. Stir in the buttermilk. Dollop the mixture on top of the filling (it's okay if there are spaces between the biscuits). Brush tops with cream. 5. 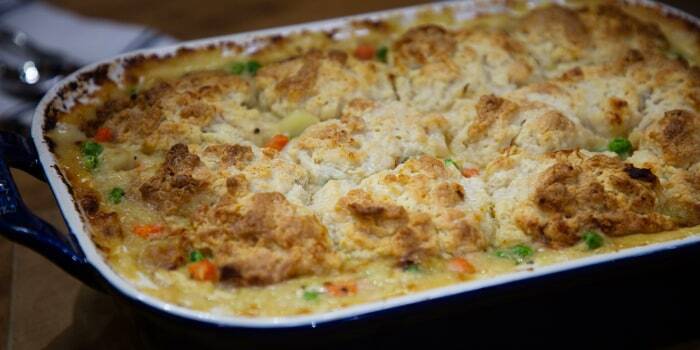 Transfer casserole to the oven; bake until top is golden brown and filling is bubbling, 35-45 minutes. Let cool 10 minutes before serving.